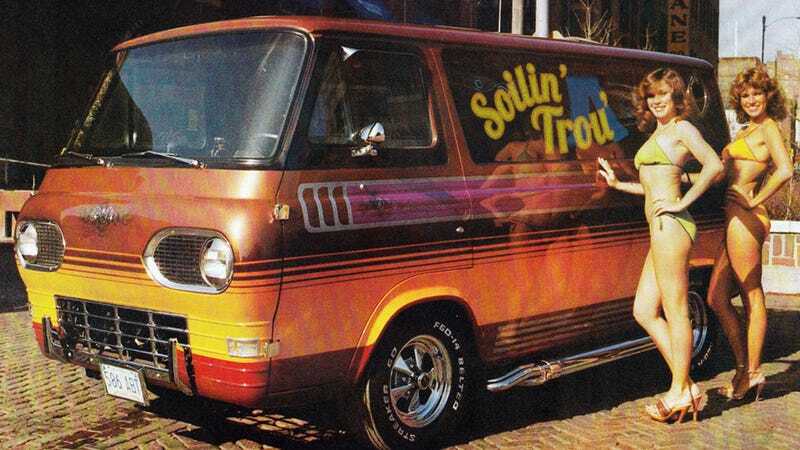 I often like to reflect back on an era — a magical era — when not only were vans considered cool, but they often sported elaborate airbrushed side art and evocative names. Names that usually replaced a final ‘g’ on a gerundive form of a word with a kicky apostrophe. So let’s make up some really terrible ones! You know how much I love terrible things, right? I’ll get us started with three awful van names, each fitting that basic 1970s formula, but somehow more disgusting, or creepy, or just sad. Up top there we have the majestic Soilin’ Trou. Mmmmm. Good times in that van! And here’s the fantastic Notary Pubic. Sexually repellent and yet mind-numbingly tedious at the same time? Yes, please! And finally, the Quiet Sobbin’. If the van’s heavin’, you may as well be leavin’, because whoever’s in there really doesn’t want to see anybody. They just can’t bear it right now, okay?